Two YA novels, both originally published by Hodder Children's Books, now republished as an ebook. Two deep, fast-paced, mind-stretching, coming-of-age thrillers, appealing particularly to readers who enjoyed Nicola Morgan's most recent YA novel, Wasted. Sleepwalking won the Scottish Arts Council Children's Book of the Year and both novels attracted great praise from reviewers and readers. An 18-year-old girl and a charismatic cult-leader, both damaged by their pasts. 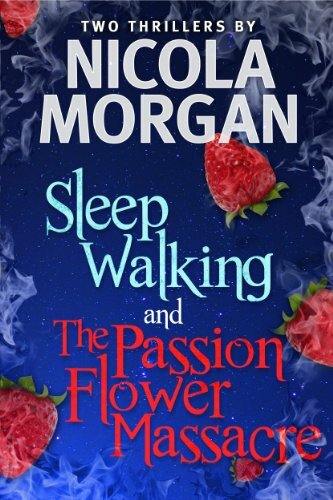 A summer of strawberries, freedom, heat, temptation, passionflowers and murder. Twenty-five years later, an old woman with secret reasons for visiting the cult-leader in prison. And a final twist. In a cowardly new world, the Citizens are free from suffering and pain, all their decisions made for them by the apparently benevolent Governators. But the Outsiders risk their lives to fight for real freedom, free will and the power of language. When a virus strikes, four chosen teenagers will need courage beyond imagination. If they can’t solve the City’s chilling secret, they will all die, along with Hope. The Independent: “… a turbulent story of revolt where it really matters [...]. This is Morgan’s third novel, and as before she writes with intelligence..."
16-year-old blogger, Charlea Harrison, on the new double ebook edition: "These two novels were the first that I had ever read as an eBook, and at first I was apprehensive as to whether the experience of reading would be the same... Luckily for me, I was presented with two books teeming with imagination, originality and loveable protagonists. What more could you ask for?"